Elegant handcrafted faceted amethyst cluster drop earrings in 925 sterling silver with a 22 carat gold plating. 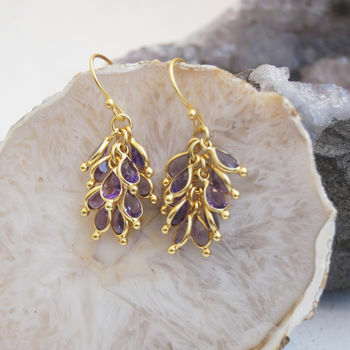 These earrings are also available in peridot or blue topaz. 925 sterling silver with a 22 carat gold plating. This product is dispatched to you by Carousel Jewels.